When it comes to food and the menstrual cycle, we often focus on what we want to eat and when, which comes down to the cravings and binges that usually happen during the premenstrual phase. We don’t often think about how to nourish our bodies when we’re menstruating. For most women, their appetite actually lessens during the actual period week and cravings can subside. However, your body is calling out for foods that will comfort, support, and sooth any symptoms – from the fatigue, to the low mood, to the difficult bowel movements. There are foods you can choose to eat more of during your period that will make you feel better and give you an overall improved period experience. The Monthly FLO protocol finds its foundation in Cycle Syncing food choices to your menstrual cycle phase to create happy hormones and hormone balance, and in this process the menstrual phase gets just as much attention as the pre-menstrual or ovulatory. Your body is doing an amazing thing during this phase, as it is throughout the cycle, and it needs your support! Your period should be a time of supercharged self-care and so much love for your body. When we talk about menstrual care we often just think about tampons and pads, when we really should be thinking more holistically and broadly about supporting our health and hormones. Here’s to a better period! 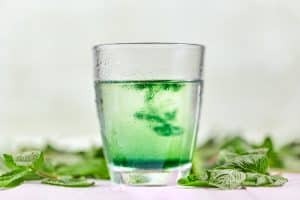 Liquid chlorophyll – chlorophyll works to raise your iron levels. You’re losing blood, so you need to add in the iron. Other iron rich foods are spinach, lentils, and grass-fed beef. But liquid chlorophyll is a simple addition and packs a powerful iron punch. If you experience clots, heavy bleeds, or fatigue during your period this is especially important. 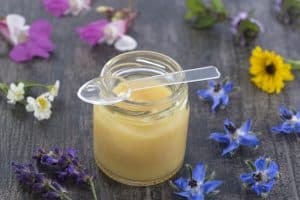 Royal Jelly – rich in amino acids, a necessary building block for hormones, royal jelly can support you during the time in your cycle when your hormones are at their lowest ebb. You can also find so many essential amino acids in a whole egg, yolk and all (don’t skip that yolk!). You can add royal jelly to an afternoon smoothie for a pick-me-up. 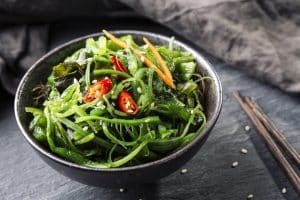 Seaweed – also rich in iron, seaweeds of all kinds are a great choice during your period. Warming foods are best at this time of the cycle, so use seaweed to create a rich broth or soup. Your body is not in the hormonal place to process raw, cold foods during your period, so seek out warmth and rich nourishment. 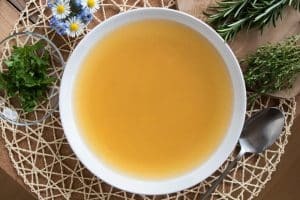 Bone broth – bone broth is soothing, relaxing, and can help with sleep. Have a big cup in the evening before bed when you’re on your period. Bone broth is also packed full of amino acids and it can help a lot with bloating and digestive discomfort during your period. If you experience a constipation/diarrhea cycle during your period, avoid eating too many raw veggies and fibrous foods. Hi, just wondering….The list of recommended foods lists kale ax greens – how come if spinach lentils etc are great iron building foods, are they listed in the other phases? Why would you recommend eggs, grass-fes beef, and bone broth during menstruation? Eggs have arachidonic acid, which increases cramping, and poultry and meat increase pain-causing prostaglandins. 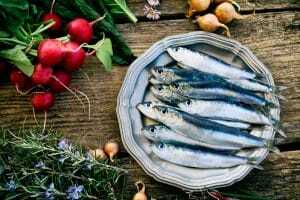 Foods that increase pain-relieving prostaglandins are salmon and Omega 3’s.